The Gita says, 'Individual cannot achieve anything on their own as they are, but puppets in creator's hands. They have to play the part, destined by their prarabdha.' Can one escape one's prarabdha? Yes, if one has conquered 'I am the body', thought, then name and form do not bind, even prarabdha does not bind. Prarabdha is experienced by mind, which leaves the mind once the mind is torn. The fruit of the actions done in previous births is called as Destiny. If a calf is left amongst 1000 cows, it still comes back to its Mother cow. Similarly irrespective of the number of your births , the fruit of your action gets back to you alone. Destiny resembles a stack of hay being over flown in a river. None can stop its course. If you think of changing your destiny utilizing your intellect, it is either equivalent to trying to stop a tsunami with your hand or trying to obstruct a bull dozer with your head. When Bhagavan's Mother found Him in Tiruvannamalai, she begged him to return, but no amount of weeping and pleading had any visible effect on him. She appealed to the devotees who had gathered around, trying to get them to intervene on her behalf until one requested that Ramana write out his response to his mother. He then wrote on a piece of paper: " Inaccordance with the prarabdha (Destiny to be worked out in current life) of each, the One whose function it is to ordain makes each to act. What is not to happen will never happen, whatever effort one may put forth. And what is ought to happen will not fail to happen, however much one may seek to prevent it. This is certain. The part of wisdom therefore is to stay quiet. I met Sri Nannagaru for the first time in the year 1989 in Bhimavaram. After 3 years I got to know that he has been visiting Kukatpally off late. Upon knowing that we stay closer to the place, he said "I'll surely come". I visited him not very often. 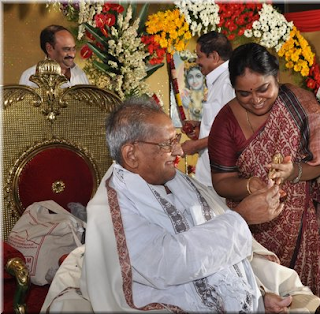 Nannagaru once asked Jaya - "We haven't seen Nagalakshmi lately". Jaya used to yell at me, and force me to visit him. The association of a devotee will effortlessly pull towards God; such is my relationship with Jaya. I used to argue with Jaya that family comes first and then God. She got fed up with me and said - "We'll see whether you will tread my path or I will tread your path, and God will decide that." After some time she used to forcefully take me to satsang gatherings. Rather than saying that I got closer to him, I think it would be correct to say, it was actually he who pulled me towards Him. His words made me think through, I would find everything new and beautiful in life. The mind which was always worried got transformed into a peaceful mind through his teachings. I never found questions in his preaching. His preaching made my mind still then and there. Nannagaru once said, "The importance that we give to money and fame, we don't give the same to purity". After hearing this sentence I felt we should put some effort in order to gain purity. In order to get a grip of the subject, and to constantly contemplate upon the same, he always asked me to attend spiritual gatherings. During initial days, I used to feel that the beauty in listening to the subject doesn't exist in teaching the subject. Afterwards, I felt that if ego doesn’t involve while teaching, then there is beauty in teaching as well. How can I repay the debt of Sri Nannagaru, who changed my perception that worshiping God alone doesn't constitute devotion, corrected me and gave qualification to practice Self knowledge and showered the nectar in it. Sky is the limit for his preaching. Every sentence that he preaches should be grasped with interest and remembered, if possible should be shared with others. The specialty of Nannagaru is whatever he preaches, he will make us experience in due course. We cannot do anything without His Grace.